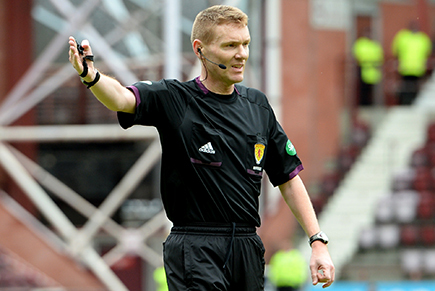 Referee for this Saturday’s SPFL Premiership clash with St Mirren at Fir Park is Calum Murray. Murray is an experienced whistler with well over fifteen years in the top flight. Somewhat surprisingly though, this is his first match at Fir Park for almost eighteen months. The season previous it was three matches. The second was a 1-1 draw with St Mirren in December, Michael Higdon grabbing Motherwell’s goal and the last was the 3-2 win over St Johnstone, Keith Lasley and a Henrik Ojamaa double separating the sides. His overall record in charge of the Steelmen is fairly mixed. Of the 21 games he has taken charge of, Motherwell have won nine, drawn four and lost eight. The Fir Parkers have scored 28 whilst 29 have hit the back of the ‘Well net. 61 players have seen yellow on those fourteen matches, 33 of which were shown to a player wearing Claret and Amber. Only one player has been sent for an early bath, Bob Malcolm in the famous 1-0 win over Celtic back in early 2008. Calum will be ably assisted by Gavin Harris and Frank Connor with Mat Northcroft on fourth official duties. Brian Cassidy is the Referee Observer and John Connolly is the SPFL Delegate. The Keith Lasley Testimonial Committee has today released the following brief statement. “Due to unforeseen circumstances and difficulties surrounding fixture arrangements during this summer, the Testimonial Committee is now planning for a match either later in this year or into 2015. Highlights from New Douglas Park as the Under 20s go down 1-0 to Hamilton Accies in the new SPFL Development League. U20s boss Jonatan Johansson has demanded his young side to learn from tonight’s defeat to Hamilton Accies. Injury and suspensions carrying from last season meant the former Finnish International had little to choose from and his squad was made up of seven players still eligible to play for the Under 17s. Hamilton’s side was certainly more familiar and played with a little bit more savvy, demonstrated by player-boss Alex Neil in the middle of the park. The hosts deservedly won the match with Stephen Hendrie’s goal after just five minutes. In truth, it perhaps could have been more with the form of Scotland Youth stopper Ross Stewart the real bright spark from an otherwise disappointing night at the office for the Claret and Amber men. Speaking to MFC TV, now free-to-air on Motherwell’s You Tube Channel, Johansson said: “I was disappointed that we looked indecisive the whole night. I felt our reaction to things that were happening on the pitch wasn’t good. “They were much sharper than us, they reacted quicker to second balls and throw-ins and stronger than us in set-pieces; all the so-called smaller things that perhaps a young player takes for granted. “There were a lot of first-years in the team tonight and they’ve got to quickly learn that this is the standard they are going to be up against on the physical side. Motherwell U20s started the season with a disappointing 1-0 defeat to Hamilton Accies at New Douglas Park this evening. It finished that way but Accies spurned a number of opportunities thanks to some excellent goalkeeping from Ross Stewart and some slack finishing, including an 85th minute penalty miss. ‘Well failed to really trouble Blair Currie in the home goal, with a Dylan Mackin shot in the 90th minute the best the Steelmen could muster. In fairness, it was an extremely young side that was listed by Jonatan Johansson with four players in the starting eleven still eligible to play for the Under 17s. Experience did come in the shape of Iain Vigurs, who only lasted 37 minutes before having to be withdrawn and Bob McHugh who was replaced the interval. Accies had the recognisable face of manager Alex Neil in the middle of the park, but he too subbed himself at the break. ‘Well made a positive start and looked up for things in the very early exchanges; Dom Thomas posting early intentions with a nice piece of skill and cross that was cleared. However, it didn’t take Accies long to settle and they were ahead on the fifth minute. A move across the park landed at the feet of Hendrie on the left flank and he took a touch to set himself before drilling an unstoppable shot into the far corner. It could have been worse for ‘Well three minutes later and only a superb double-save from Stewart kept the score at 1-0. Danny Armstrong’s cross was headed goalwards by Andy Ryan, which the Steelmen stopper somehow blocked from point-blank range. Incredibly, he was up like a flash to block Greg Docherty’s rebounded shot with his legs. Johansson’s men looked rattled at this point, with Accies creating and passing up several chances with Eamonn Brophy, Ryan and Armstrong all denied by Stewart with Docherty firing a shot wide. It took Motherwell until the midway point to create; Craig McCall seizing on Neil’s headed clearance but his hung up cross for Dylan Mackin was headed over by the big striker. As the half wore on, both teams had half chances. Brophy fired high and wide and Thomas had Motherwell’s only effort on target during the first forty-five with a low shot comfortably held by Currie. The hosts did have the ball in the net again before the interval; Armstrong’s curling shot was palmed out by Stewart only for Ryan to tuck home the rebound. However, assistant referee Matthew MacDermid’s late flag ensured the game remained at 1-0. Motherwell introduced Higgins for McHugh at the break and he caused immediate problems with his pace. After just three minutes, he latched onto a short back pass but after cutting it back for Mackin, Accies had managed to get enough men behind the ball to block. However, it wasn’t long before Stewart was back in action and he had to look smart to tip over Armstrong’s swerving effort. Four minutes later, the Scotland Youth International was at it again, this time denying Docherty from distance. The game ten hit a lull with neither side creating much in the way of clear-cut chances. Both had some sniffs, Ross McLean almost connecting with Chris Cadden’s ball into the area at one end, Jesus Garcia Tena bringing out another smart stop from Stewart with a bouncing free kick from twenty yards. With ten minutes left, Accies again spurned a golden chance from the penalty spot when Adam Cummins was adjudged to have tripped Ryan. Docherty stood up to take but his low shot came back off the base of the post and spun clear. That should have provided ‘Well with the shot in the arm that they needed to rescue the match but, in truth, only a ninetieth minute turn and shot by Dylan Mackin caused Currie any concern. It was a flat opening for Johansson’s side who admittedly were up against it in terms of experience and numbers, with several key players injured or suspended. Frustratingly, there is a two-week gap until Dundee United’s youths visit Fir Park. Due to popular demand Motherwell Football Club Community Trust have added an extra week to the successful Summer Soccer Camps. The final week will take place from Monday 11th August – Friday 15th August from 8:30am till 3:30pm for boys & girls aged 5-15 years and will be held at Fir Park with coaching sessions taking place on the Fir Park AstroTurf & in the Maxim Office Park South Stand Gymnasium. The coaching sessions will be delivered by SFA accredited coaches & will focus on passing, shooting, tackling as well as fun competitions and small sided games. Participants will also have the opportunity to rub shoulders with some of the Motherwell FC first team players as they prepare for the start of the Scottish Premiership 2014/2015 season. Prices for the Soccer Camp are £11 per day & £50 for the week.